Melodic lullabies born of Michael’s clear, heartbreakingly youthful voice… unexpected minor-keyed lyrics tug melodies into delicate, poignant regions of bittersweet sadness… Giant oceansful of ebbing electronics and gently rolling guitars washed with emotion; there’s an innocence here, and yet a sense of depth, of understanding… much like the swirling ache of falling in love. In the early ’90s, the Projekt label scored a striking trifecta by bringing three different and fascinating bedroom-studio acts from Arizona to wider attention via strong debuts — Lycia, Lovesliescrushing, and Soul Whirling Somewhere. Michael Plaster, the person behind the last act, produced such a beautiful, reflective album in Eating the Sea that it almost seems like the result of an artist with many releases’ worth of experience. With gentle guitar, understated rhythm tracks, and spectacularly rich, lush keyboard washes — something more than anything else that explains the Projekt connection, being not that far removed from the evocative work of fellow Arizona denizen Steve Roach — Plaster creates a delicate, meditative collection. A semi-comparison might be to the similarly underappreciated work of Butterfly Child, but unlike Joe Cassidy, Plaster tends to let his voice disappear into the mix, with slightly more straightforward arrangements. The slow, deliberate build of “Not Breathing” into a lovely balance of heavily echoed acoustic guitar over calm, steady synth flows and the sad space-signal chimes of the treated electric guitar on “I Dream We Are Blind” handily demonstrate his ability with those arrangements. “Wish” lets Plaster focus on his keyboard work — the combination of a soft, descending melody and his voice seeming to rise from forgotten depths works wonders, a combination that doesn’t quite sound like much else. “Swim” aims for a more ambient style (though the melody is there at its heart, simple but very dreamy), while Plaster’s singing takes center stage in comparison, gentle but not overly twee or light, say. “You’ll Tear Me Away From You” is the album standout, with Plaster’s typical calm instrumental beginning leading to a softly loping, melancholic arrangement, his yearning voice the perfect addition. Every once in awhile, you purchase an album that makes you completely reconsider everything else out on the market. 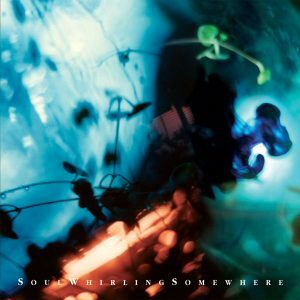 For me, one such album is Eating The Sea, the Projekt debut from Soul Whirling Somewhere, a band out of Arizona. Everything about this album, from the music to the lyrics to the packaging — lovely aquatic-like photography which really helps set the mood — is exquisitely created by Michael Plaster, the sole member of Soul Whirling Somewhere. The album begins with the instrumental “One Of These Days Some Eyes Will Be Opened,” a song which sets the musical groundwork for the album. Soft, gentle, minor-keyed synth washes that seem to roll over and through each other, such is the formula that is used to perfection by Plaster. The songs are sparse yet warm, like Plaster is inviting me to hear revelations of his deepest anxieties and feelings. I cannot recommend this album highly enough. I find it to be the perfect album to listen to at night, with the lights off and the blinds closed. This is powerful, introspective music and means a great deal to me; it’s very rare to find an album that does that. Eating The Sea never ceases to amaze or inspire me every time I listen to it and this, in my opinion, is what music has always been meant for. There are so many good things to be said about this disc. I’ve been wanting to review it, every since I bought it, but have been scared to do so. This is an intimidating disc to me. Eating The Sea is so beautiful. Projekt spared nothing when it came to putting this one together. 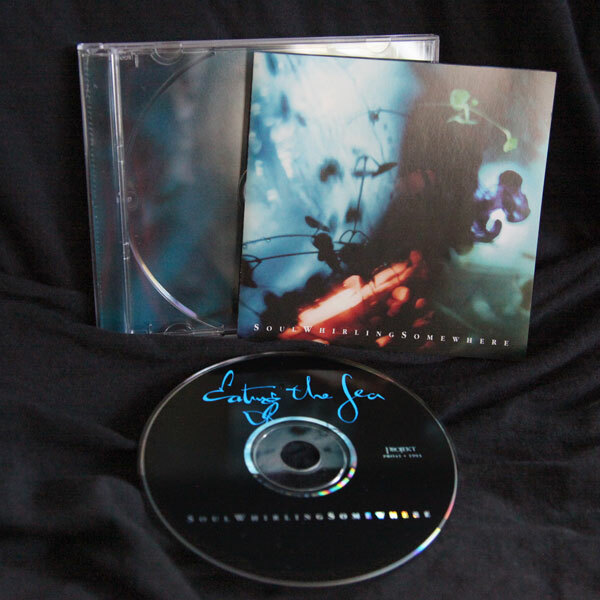 The disc comes in a clear plastic jewel case with subtle cover and interior photos by Susan Jennings. Darkwave is even offering a Wallpaper Rate on Eating The Sea posters, buy 5, get 5 free (PRO43p $20), which again features the same abstract aqua art. Not exactly what I’d do my room in, but knock yourself out. All through this disc the linear notes are done with a wash of colors, and guess what folks, there are printed lyrics! Ironically though, this is a band where they aren’t needed. Strangely, no song really stands above its peers. This is not to imply that all the songs sound alike, or that none are spectacular, I just can’t find one I like better than the others. I’m listening to this disc as I write this review (I almost always do that), and every time a new song comes over my headphones, I think, “Yeah, this is the best song on this disc!” Well, track 4, “Wish,” is playing right now, so I would have to say it’s the best. “Wish,” and almost all the songs on this disc, have a real personal feel to them, like I’ve somehow managed to walk in on Michael Plaster singing to a lover, except there is no sense of embarrassment on my part. “Unhittable” is playing, so accordingly is now the best song. With lines like, “i sink into the pool of blissful sighs and choke myself to death, knowing that, sometimes, strangeness can never be recaptured,” well excuse me, while I try to recover. It’s not the words exactly, but the way they fit with the music. Oh this disc is just too exquisite. Eating The Sea is a slow, synthe driven, vocal dependent release. Listening is much like having someone sing you to sleep. It’s by no means boring, but rather relaxing. The recording is splendidly clear and pleasurable to listen to. I’ve already said no songs stand above or apart, and amazingly no songs fall short either. Out of all the reviews I’ve done so far, this is only one of two that have managed to escape my pen without negative comments. Since this is a debut, it will be interesting to see if Soul Whirling Somewhere will meet my high standards with their next release (hey, they’re the ones who put my expectations through the stratosphere). I’ll be buying anything else I can get by this band. In the early ’90s, the Projekt label scored a striking trifecta by bringing three different and fascinating bedroom-studio acts from Arizona to wider attention via strong debuts — Lycia, Lovesliescrushing, and Soul Whirling Somewhere. Michael Plaster, the person behind the last act, produced such a beautiful, reflective album in Eating the Sea that it almost seems like the result of an artist with many releases’ worth of experience. With gentle guitar, understated rhythm tracks, and spectacularly rich, lush keyboard washes — something more than anything else that explains the Projekt connection, being not that far removed from the evocative work of fellow Arizona denizen Steve Roach — Plaster creates a delicate, meditative collection. A semi-comparison might be to the similarly underappreciated work of Butterfly Child, but unlike Joe Cassidy Plaster tends to let his voice disappear into the mix, with slightly more straightforward arrangements.